the section isolators in the overhead, which might be hard to see – follow the wire over each track to the white break in the line. Because of where these are placed, if you’re taking a train car into the shop, you can’t stop at the shop entrance because your pantograph would be in that unpowered section. So you do not stop at the shop door before you go in – instead a flagger will make sure the way is clear and then direct you inside. Always safety first. 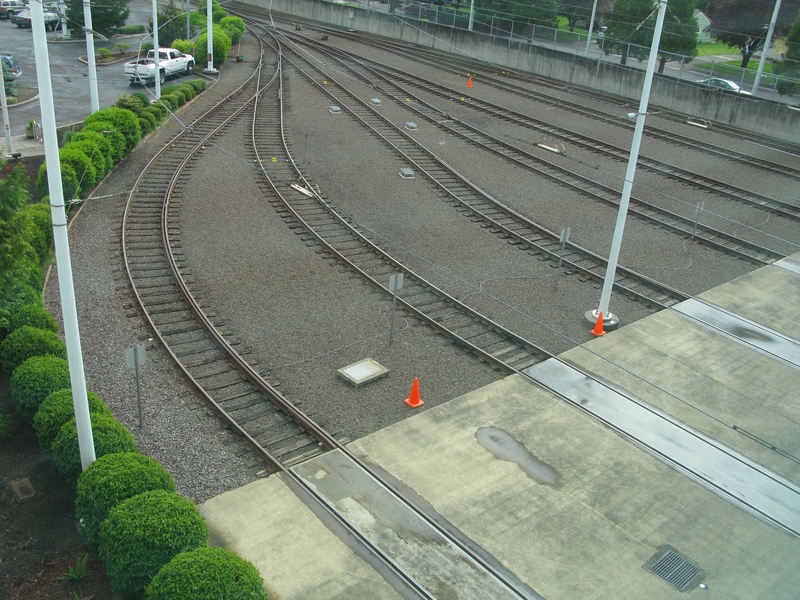 the track designations/fouling markers – these are little yellow tents in the tracks, sort of like the decision point markers found on Burnside. Fouling markers are always yellow and show you where you cannot stop a train beyond. Trains are wider than the tracks they are on, which was a factor in this recent heavy rail fatality, so if you stop a train beyond the fouling marker, you can collide with a train on the next track because of the space you both take up. All fouling markers here double as track designations, but not all track designators at Ruby are fouling markers. This entry was posted in general TriMet, pantographs and catenary and tagged fouling marker, light rail, max train, portland, public transit, public transportation, rail, railroad, ruby junction, safety, trains, trimet. Bookmark the permalink.